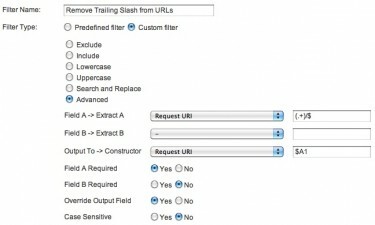 Google Analytics filters are great for excluding certain data from your reports, such as traffic from your company's IP addresses or staging server. They're also relatively simple to create. In addition to the general Exclude and Include filters, GA also offers an Advanced filter option. In their help documents, Google does a good job explaining what to do, but not why you'd actually want to use this option. I want to share three helpful filters we've used at Viget that help make your data cleaner and workload lighter. I'll also share a few more soon! If you tag all your paid media with a utm_source of "media", then once you've added this filter, your Source report will show not a source of just "media", but media_referringurl.com. Yippee! This will clean up your URLs for any referring site ending in .com. You can do the same with all other sites, replacing the ".com" parts of the filter with .org, .ly, and any other domain extension that might be hosting your ads. It will lob off the "/" at the end of the URL, but it will still keep your homepage in tact (which normally appears as "/" in your reports--and you probably don't want that disappearing!). Hope these are helpful! Do you use any other filters that make your life easier?